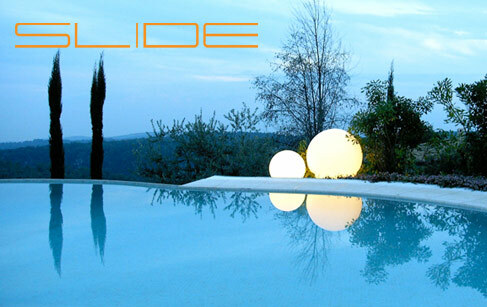 Slide adopts a 'lounge' attitude both indoors and outside with their furniture and lighting products. This Italian label has found enormous success by focusing on essential forms which don't take themselves too seriously, in a light, resistant plastic, acid bright colours, and using gentle sensual light. With Slide, you can be as daring as you like in doing up a trendy, modern living space, either on the terrace or in a lovely spot in the garden. The best designers of the moment have collections dedicated to chic relaxation: Marcel Wanders and his Chubby armchair, Karim Rashid and his Koncord stool, and Paola Navone and her Low Lita collection. And Slide's flagship product is Cubo, a large luminous cube which serves as a coffee table or stool.